Blogging the Active Office Build! Here’s a first glimpse at our furniture installation which took place on Tuesday and Wednesday. The fantastic, height adjustable, A-frame tables had a previous life in an office in London. While the original vitra chairs in the meeting room were saved and lovingly restored by Rype Office, allowing us to snap them up at a fraction of their original price. The installation of the Tata Coretinium® idea walls took place on Friday and not only look great, but will provide us with useful surfaces to capture creative thinking. Friday was a historic day for the primary connection of both the Active Classroom and the Active Office, allowing them both to feed surplus power into the grid, through a novel export limiter – even though it is an overcast day, in the first hour we’ve already exported 10.5kWh! It wouldn’t have happened without the perseverance of Richard Lewis and the support of Tom Griffiths. Demma Controls were busy commissioning the building this week, while Wernick attended to the finishing touches, ready for building handover on Friday. That just leaves the battery and solar thermal installations to be completed, both of which are well underway. You just can’t keep Richard and Tom out of a plant room – here they are connecting up our roof sensors to a control panel. As a reminder, we have fitted several environmental sensors to the roof – the intensity of sunlight will be measured using pyranometers; ambient and surface temperature sensors will be used to monitor any changes in PV efficiency with temperature; and a wind sensor will calculate the effect of windspeed and direction on solar thermal generation. The earth mound outside the Active Classroom has been redistributed around the office, improving the landscape areas around both buildings. This will eventually be seeded with a native Coastal Areas wildflower mix. 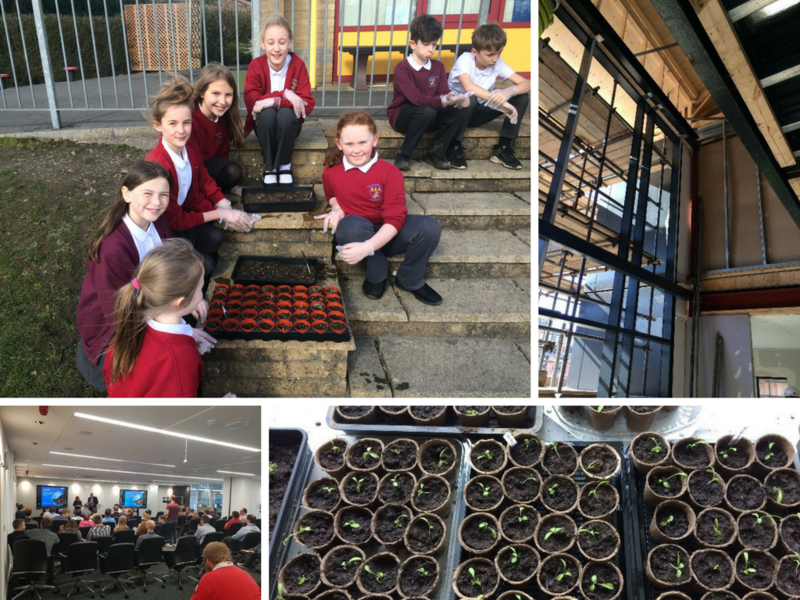 And, I hosted a group of Year 5 pupils from Pontarddulais Primary School on Thursday as part of their STEM week, teaching them all about solar energy and the future of the built environment. Their visit included a tour of Swansea University’s Bay Campus and various activities, such as making solar powered windmills and completing solar puzzles. Great to be inspiring our next generation of engineers! We’re almost there now! 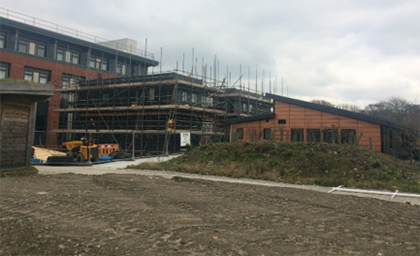 This week saw the cladding completed; the scaffolding come down and the external works, including the fire escape staircase and the paving to the building entrance, undertaken; enabling the building to be viewed properly for the first time in relation to its setting. Several people noticed how the building profile ties in with the Active Classroom and adjacent ESRI building, with the curve being on a tangent with the line of the Active Classroom roof. How the window detail matches ESRI can also now be appreciated fully. The batteries arrived on Tuesday and installation of the supporting infrastructure commenced, to be completed next week, along with commissioning of the mechanical and electrical installations. The spacious plant room is now looking pretty crowded, full of the equipment that is at the heart of operating this smart building. Internally, the glass balustrading to the first-floor balcony is looking fantastic, just waiting for the final steel trim to be fitted, and all areas were given a thorough clean. Snagging of the interior was carried out on Friday, so that any final bits can be completed next week in time for building handover. Surplus bricks from the build have been taken away by Swansea Care and Repair, as part of the Recipro Wales scheme, which is a collaborative project between Recipro UK, Constructing Excellence in Wales and Swansea Care and Repair, linking the construction industry with not-for-profit organisations to enable the reuse of surplus building materials donated by the construction industry. Benefits of the scheme include: reducing levels of waste at landfill; giving surplus materials a second chance; and benefitting charitable organisations and community projects – thanks to Evabuild for helping us do our bit for the local community! The brackets for the Naked Energy PV-T tubes have arrived and are now installed on the south elevation ready to receive the evacuated tubes which will supply approximately 9kWh of warm air into the heating system and some additional electricity to compliment the BIPV Roof. Through collaboration with Cisco the office will utilise a smart network infrastructure and Internet of Things communication system. This will include the ability to create a heatmap of the building indicating locations of people within the offices and monitoring occupancy rates. Smart lighting will be controlled by occupancy detectors via the infrastructure. In the future, electric vehicle charging points will be linked to the system, adding the ability to locate vehicles, determine their state-of-charge, and ascertain whether any charging points are available. Arup are developing a detailed thermal model of the Active Office, which will lead to an energy prediction calculation for the building in line with CIBSE TM:54 – Evaluating Operational Energy Performance of Buildings at the Design Stage. The outputs of this model will provide a timely case study for comparing operational energy performance of buildings to design stage predictions, of particular interest as the draft for the new BREEAM 2018 includes more emphasis on a more accurate prediction of both regulated and unregulated energy emissions, in order to gain Ene1 credits required for a high BREEAM scoring. This case study will provide Arup with a methodology for undertaking better-informed calculations of energy use in operation, while demonstrating that energy performance is dependent on how a building is run and maintained, as well as how it is designed and constructed. Internally, we will be showcasing Tata Steel’s Coretinium®, installed by Reform Systems Ltd who have been working closely with Tata to combine Coretinium® with their novel flexible fixing system. Features will include ‘brainstorm’ walls in offices and meeting spaces, allowing creative ideas to flow freely on a robust and wipe-clean surface. For the interior, we are working with a Welsh design agency, ICON Creative, to bring the space to life with wall designs and splashes of brand colour! As mentioned last week, we are also working Rype Office to furnish the interior with sustainable, remanufactured pieces. We met with the team this week to discuss the room layout and choose our fabric colour swatch. And the east elevation is revealed as the scaffolding starts to come down! We have three electric vehicle charging points on this elevation, now clearly visible. Next week the external landscaping will commence. The living wall on the east elevation has been filled with a soil and sand mix, and planted with a variety of native plants that have been nurtured from seed. These will soon spring to life, bringing colour to the east elevation, matching the wall on the Active Classroom, which is looking very healthy and colourful at the moment. Internally, we’ll be analysing the benefits of Dulux Forest Breath, for our industry partner, Akzo Nobel. This is a sustainable indoor paint with an anti-formaldehyde formulation, introduced in China in 2016 to address the country’s focus on improving air quality. We will undertake some air sampling to test for formaldehyde and a range of other VOC’s, using adsorption tubes to capture formaldehyde and other organic species. One office will be painted using Forest Breath and a corresponding office in normal emulsion, allowing us to test the air in both spaces, as well as outside, and to see the difference made to the air quality through use of the specially formulated paint. We are thrilled to be working with Rype Office to furnish the interior. Rype Office provide sustainable furniture, combining ethically sourced and high quality remanufactured pieces which have an 80% smaller environmental footprint than those made from virgin resources. Some of the furniture will be made new by the Merthyr Tydfil Institute for the Blind. Sustainability benefits include: reduced waste and landfill; lower greenhouse gas emissions, and; creation of UK jobs. Last Friday we held our Quarterly Review Meeting with Innovate UK, which presented an ideal opportunity to show the main funders of the Active Office what we’ve been up to and how the build is progressing. They were impressed with the speed of construction and how much the site had changed in such a short space of time! Environmental sensors have been fitted to the roof by our very own Bruce and Richard, to capture data which will help to assess the true energy performance of the building. Photovoltaic (PV) panel performance varies under differing climatic conditions. The intensity of sunlight will be measured using pyranometers installed on the roof and compared to power meter readings to calculate how efficient the building integrated PV is at converting solar energy into electricity. Ambient and surface temperature sensors will be used to monitor any changes in PV efficiency with temperature, while the installed wind sensor will enable the effect of windspeed and direction on solar thermal generation to be calculated. And here’s a first glimpse of the interior office spaces, decoration is progressing well and the second fix electrical installation is well underway. The high ceilings and exposed ductwork provide a lovely spacious feel to the offices. We are still on target to complete the build by the end of May. This is partially down to the use of off-site construction and partly due to Wernick’s trusted relationships with their supply chain, who have all pulled together to make this project happen. One of the benefits of off-site construction is the reduction in site waste generated. However, inevitably, there will always be some waste and what better way to re-use some of that than in an innovative garden. Swansea University’s Sustainability Team were recently awarded a grant from Grow Wild to develop a wildflower garden at the Bay Campus to echo its industrial heritage, giving new life to reclaimed pieces of industrial equipment to form the framework for the garden before seeding it with a mix of native wild flower seeds and plants. 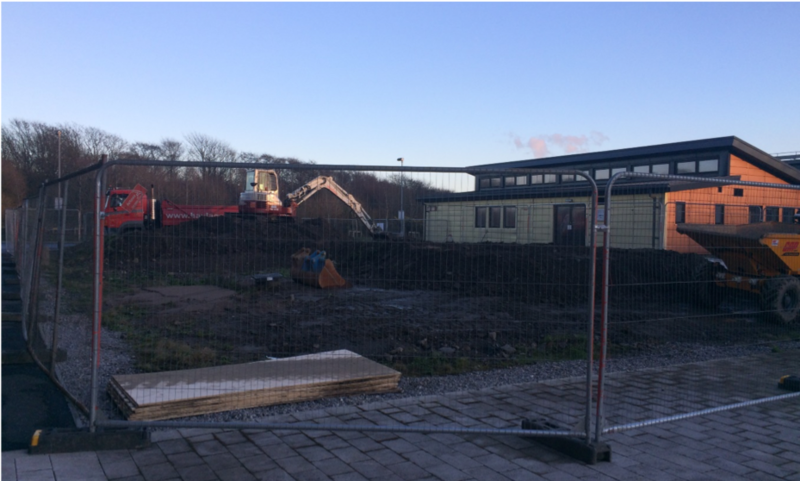 We were pleased that some of the pieces of ductwork left over from the Active Classroom build could be put to use in this, providing them with a new purpose. I was delighted to accompany Wernick to an RIBA Core CPD seminar entitled “Is off-site the future of Construction?” on Thursday, delivered by Markus Selfermann of ÜberRaum Architects. This gave a fascinating insight into the world of off-site construction, including the history and challenges, and provided the perfect platform to talk about our Active Office. The Seren Gold Colorcoat® Prisma cladding on the east elevation was shining in the sun on Friday morning, as was the BIPVCo roof, which looks stunning on the curved profile. 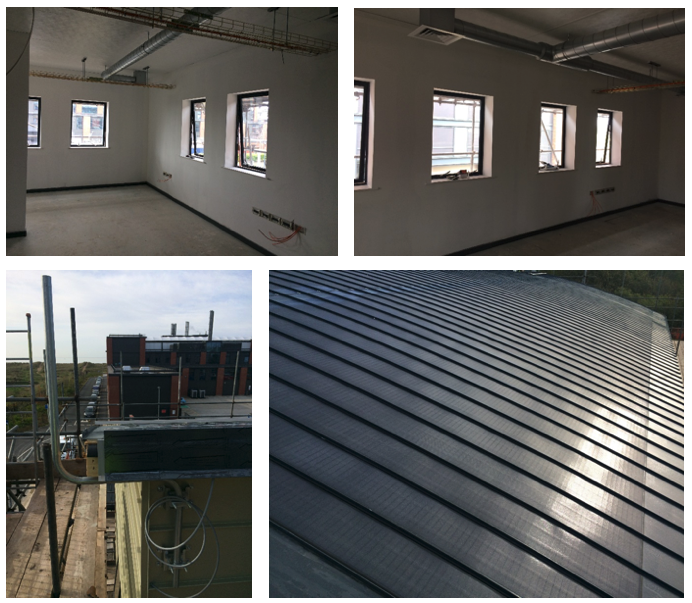 Other progress made this week includes connecting the building up to the mains water supply, finishing the termination of the PV cables, first fix electrical works, internal painting and a continuation of mechanical systems installations. It’s a busy site! We also met up with specialist building management systems engineers from Demma to talk control systems – a little over my head, but all made sense to our highly proficient Smart Systems Engineer, Richard Lewis – he most certainly knows what he’s talking about when it comes to integrating the technologies and controlling them smartly! 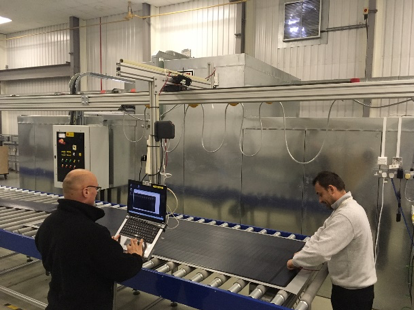 The BIPVCo photovoltaic roof installation was completed this week, and all the cables connected by Dulas, ready to be linked to the battery system. The roof looks fantastic, the flexible modules really lending themselves to the curved roof profile. The Seren Copper Colorcoat® Prisma cladding works well in blending the building into the site, matching to both the Active Classroom and the Energy Safety Research Institute (ESRI). Once the scaffolding comes down, in just a few weeks, the full vision of the building will be revealed. And an update on the plants – all of these seedlings will be making their way into the living wall within the next few weeks. Most of the progress this week has been internal – installing ductwork, pipes and cable runs, as well as preparations for internal decoration. Kelda Technology have provided us with one of their new digital shower systems, which uses 50% less water than a typical shower system, while delivering an invigorating shower experience. It looks good too! This has been significantly reduced through the use of off-site construction, which enabled the main building elements to be constructed in factory conditions, with no site hindrances such as inclement weather. Also helped by the whole project team working together collaboratively. Through working closely with our contractors and supply chain partners, it has been possible to keep costs under control and within budget. Plus, the off-site process has contributed to cost savings, partly due to a reduction in labour hours and less construction site overheads. Off-site construction enables a better quality of construction due to the controlled environment. Having strong relationships with local contractors and their supply chain has also helped Wernick ensure a good quality build. The factory environment provides safer working conditions than a construction site, reducing the amount of work that needs to be undertaken at height and during poor weather conditions, for example. The use of renewable technologies, to enable an energy positive building, significantly reduces the impact of the building on the environment. Our BIPVCo roof arrived this week! The 49no. panels, with a total of 91no. 240W modules, were craned into position on Wednesday and are currently being installed on the curved roof. They are looking good, despite the wet weather. Back in the Plant Room, Pursey and Ball are doing a fantastic job connecting up the heating system, which will be fed from the Naked Energy PV-T panels once installed on the south elevation. We’re very impressed with their neat pipework! This project would never have progressed so quickly without an open and collaborative spirit of working, made possible by SPECIFIC and Wernick Group and our supply chain partners. The ability to engage with the contractor and supply chain early in the design process, through use of the Fusion 21 framework, saved both costs and time, and enabled the whole project team to work together to ensure the successful delivery of this unique building. And we ended the week with a bit of fun – an Easter egg hunt around the Active Classroom, using interesting facts about the building as clues. Great idea Sharon and Ella! This week we had our first meeting with Dulas who are providing the grid attached energy storage system of just over 100kWh, using 8 BYD lithium-ion phosphate batteries. The PV roof will be connected up to these batteries to provide power for the building. They will also be connected to the Active Classroom battery system, providing a total of 160kWh of storage. Cladding is progressing, starting with the Seren Copper on the East Elevation, while the electrical cables are being pulled through the ducts ready for connecting the building to the main electricity grid. And more seed planting took place at Gnoll Primary School on Friday with years 3 and 4. Thank you to all involved, especially Mr Davison for arranging! To fill the wall, we need 450 plants and we already have hundreds of seeds growing in readiness to be planted in the wall. It’s British Science Week #BSW18; a 10-day celebration of science, technology, engineering and maths; so a perfect time to engage with the community on the exciting work we are doing here at SPECIFIC. We were thrilled to take part in the Intellectual Property Office’s celebrations by giving a thought-provoking lunchtime talk at their Newport Office on Wednesday as part of their week-long programme of seminars themed “The STEM of Wales”, which stimulated some interesting discussions on the changing world of energy and buildings. Back on site, the double height glazed curtain walling forming the main entrance screen was installed this week, completing the watertight envelope of the building. Internally, pipes and ductwork for the heating and hot water systems are being installed, ready for connection to the solar thermal system. The copper and gold Tata Colorcoat® Urban cladding sheets have been delivered to site this week ready for installation over the next four weeks. This will transform the appearance of the building, matching it to the adjacent buildings – the Active Classroom and the Energy Safety Research Institute. Meanwhile the roof structure has been prepared for the photovoltaic (PV) roof installation, using plywood sheeting to form the substrate for the roof sheets. We are looking forward to seeing the novel solar PV-T tubes from Naked Energy, that will be mounted on the south elevation to supply warm air into our heating system. This will consist of 40 evacuated tubes with integral PV absorber plates, generating a total heating capacity of approximately 9kWh and 2kWp of electricity to supplement the 23kWp BIPVCO rooftop array. On Friday, colleagues from one of our industrial partners, AkzoNobel, visited to discuss opportunities to include functional coatings within the building, such as Dulux Light + Space, which could reduce artificial lighting requirements, coatings that absorb pollutants and stain repellent coatings – exciting stuff! The aluminium door and window frames were polyester powder coated in RAL 7016 Matt by AkzoNobel. The glass used in the windows and curtain walling is Pilkington energiKare™ Advantage, supplied by another of our industrial partners, NSG, PilkingtonUK. We also had our first walk around the interior and were pleased with the feel of the spaces. There’s been a lot of activity on site this week, with the contractors continuing to brave the cold easterly winds and plummeting temperatures. On Monday another crane arrived on site to lift the 31 curved timber roof trusses into position, fortunately before the ‘Beast from the East’ made an appearance! These will then be covered with a layer of plywood before the photovoltaic roof covering is fitted in just a few weeks’ time. 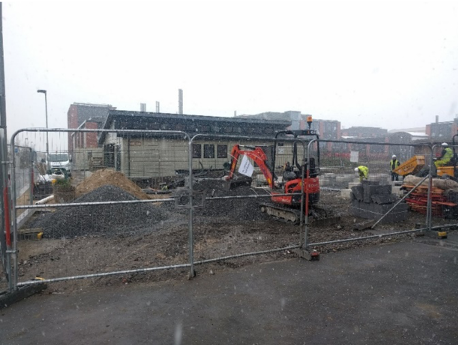 Meanwhile, on the ground, building of the brickwork plinth has commenced – this will form a base to the steel cladding that will eventually shroud the building. The service trench for the connection to the mains services has also been dug in readiness for the grid connection to be installed this weekend. To enable this to happen, we’ll have to shut down the Engineering buildings on campus for a day. With all this activity taking place to construct our second energy positive building, what better setting for a Sustainable Construction workshop on Wednesday #SupplyCSSchool. You couldn’t ask for a more fitting venue! Progress on site has continued this week to complete the erection of the scaffolding and to bolt the modules together in preparation for the roof works to commence next week. The use of a modular construction system, manufactured off-site in a factory environment, will help us achieve these KPIs, together with the fact that the building will be energy positive, generating more energy than it consumes #BuildingsasPowerStations. 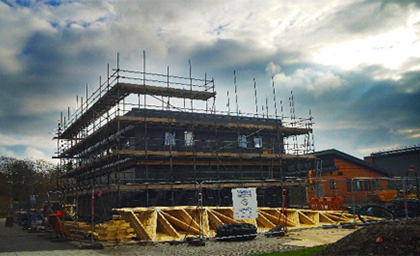 Next week, the curved roof trusses will be craned into position, which will see the building really taking shape. What an exciting week for the Active Office build! On Tuesday, the ground-floor modules were delivered to site and carefully craned into position on the pre-prepared foundations, using a 300-tonne crane. High winds and torrential rain on Wednesday delayed the delivery of the first-floor modules and the roof trusses until Thursday, which turned out to be a much better day. Scaffolding is currently being erected around the building ready for the next stage, which is to wrap the building in steel cladding, using some of the awesome new contemporary colours available in the Colorcoat Prisma® range – Seren Copper and Seren Gold. The south elevation will also include the first commercial scale installation of Virtu, a patented hybrid photovoltaic and solar thermal device, designed in the UK to provide both efficient electrical power and thermal energy to the building (https://twitter.com/NakedEnergyLtd). Also during the week, Jan Bell and Jo Clarke visited Bryncoch Church in Wales Primary School (@bryncochCIW) to talk to the children about the project and invite them to help plant up the living wall. It is critical that we engage the younger generation in creating innovative buildings and increase their awareness of renewable energy technologies, which will help secure their future. Back on site, not even snow can stop progress on this fast track build! 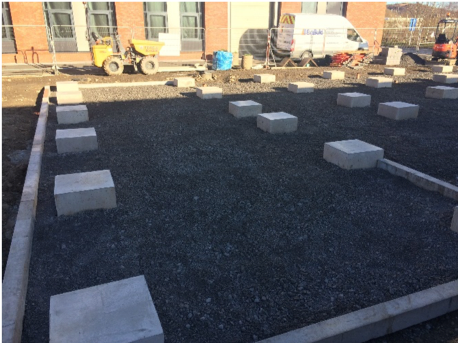 Groundworks have continued to move forward this week to prepare the site ready for delivery of the building modules next week. And finally, our first seedlings for the living wall are making an appearance – these birdsfoot trefoil plants can be found in Crymlyn Burrows, adjacent to the site, and will provide glorious coverage in the summer months when they are in full bloom. 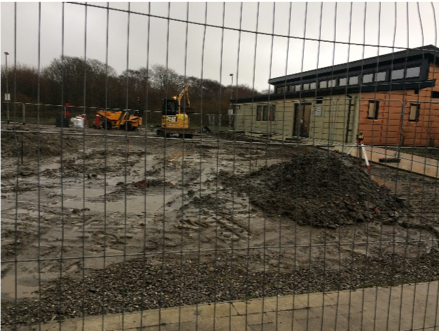 The Active Office build remains on programme, with the modules scheduled to be delivered to site on 13th February – watch this space! The foundations are complete, and the trenches dug for the incoming services, including a connection back to our Active Classroom, with the aim that in future the two buildings can share energy, optimising the amount of solar energy used and taking advantage of the combined storage capacity of 160kWh. 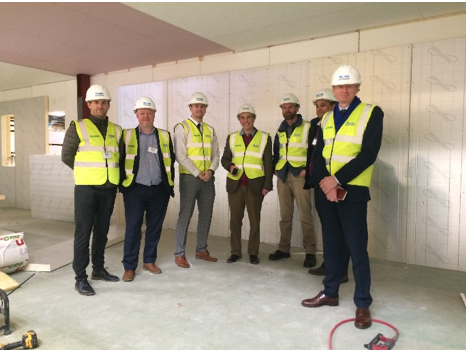 Representatives from Fusion 21 (the framework providers Wernick were procured through) visited the site on Thursday to discuss progress and the social value aspects of the project. This procurement framework is built around social values, community integration and job creation, all of which are embedded throughout the Active Office project, from the fact that the building will be energy positive, right through to the employment of local labour and involvement of local schools and colleges. The use of Fusion 21 also enabled the SPECIFIC team to engage early with Wernick, which was critical to the success of such an innovative project within a very tight timescale. 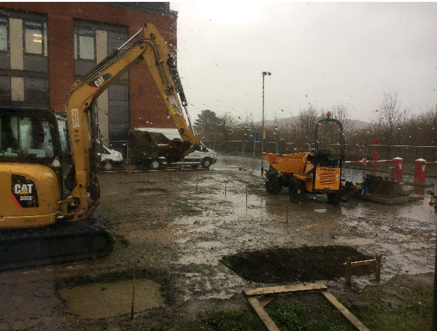 The contractors had to battle with some pretty horrendous wet weather this week, in their endeavours to complete the foundations. 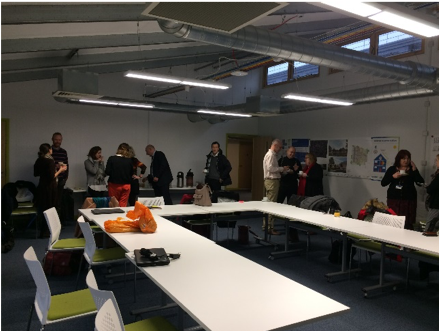 Despite the bad weather, on Wednesday the Active Classroom, adjacent to the site, hosted the Environmental Association of Universities and Colleges, who held their Welsh Branch meeting here. Once the rain had cleared, their visit concluded with a trip to the adjacent SSSI, via our living wall, which is acting as a nursery for rare species found within the SSSI. Meanwhile, work continued in the nice, dry factory, to manufacture the wall panels. If you’re going to construct a building between January and March in Swansea, off-site construction is the way to go! Here are some of our team standing inside one of the 14 modules that will make up the building. Very impressive progress for two weeks work! Despite the bitterly cold weather, progress on site this week has been impressive. Site clearance works have been completed and existing drainage runs diverted to enable commencement of the substructure works. The first foundations were poured today. 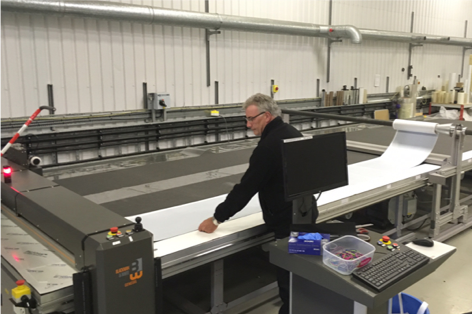 Back in the factory, the panel construction has been underway and progressing at a speedy pace! All the floor panels have been completed and manufacture of the wall panels has begun. We are happy to say that none of these works have impacted on use of the Active Classroom, in which teaching has taken place this week. On Thursday we welcomed the Welsh Government Climate Change, Environment and Rural Affairs Committee, who are currently carrying out an inquiry to inform policy developments of “Low Carbon Housing: The Challenge; Welsh Housing Policy Consultation”, to the site. Diggers arrived on Monday and, once the site was secured, started work to remove the earth mounds covering the site. The first job was to carefully dig up the existing trees which lined the eastern border of the site and put these to one side for the University’s Grounds team to re-plant. Some of these were successfully re-planted on the mound adjacent to the Active Classroom and some will be planted adjacent to Oracle 2, on new raised beds formed from some of the earthworks. The remainder of the earth was then transported to the other end of the University Campus, to be re-distributed, within the site, instead of transporting off-site. Site almost cleared, ready to commence groundworks next week…. ⟵‘Best Public Service Building’ Winners at the NPT Building Awards 2018.